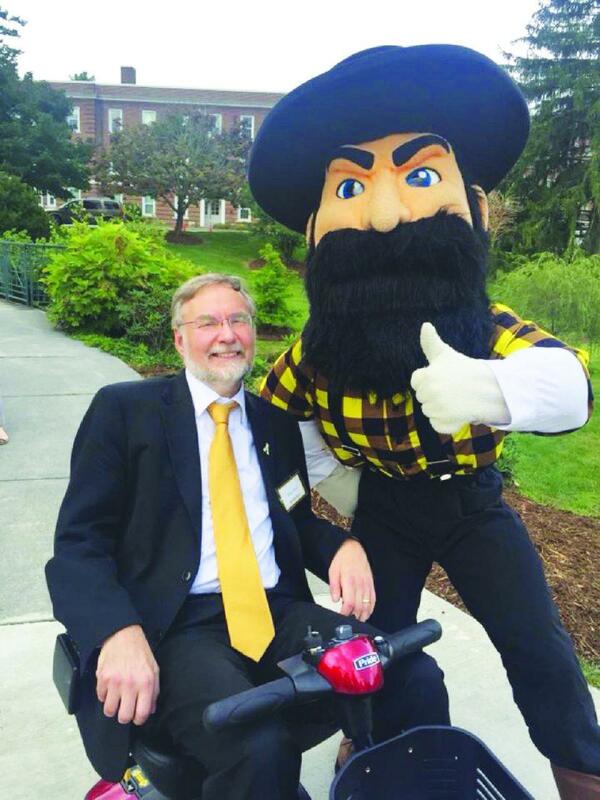 The new Dean of the Library, Dane Ward, poses with Yosef. I am the Dean of University Libraries, and I have ALS. You may have seen me in Belk Library walking slowly with the assistance of a rolling walker, or more recently driving a scooter around campus. My wife and I came to Appalachian State about a year ago. We immediately fell in love with this university, the community and these beautiful mountains. Except for a small catch in my step, I was walking normally when we first arrived and looking forward to running in the High Country. A long-time runner, I have competed in marathons, half marathons and innumerable 5K and 10K races. On Oct. 13, 2017, I was told I had a probable diagnosis of ALS, or Lou Gehrig’s Disease. In January, all other possibilities were ruled out. An incurable disease, ALS is characterized by the progressive loss of muscle strength. In my case, the symptoms first appeared in my legs and gradually spread to my arms. Most patients die within five years, but an increasing number live more than 10 or 15 years. I intend to be one of these. In the absence of a cure, many patients pursue alternative treatments that hopefully slow the disease’s progression. ALS remains an inscrutable disease that can affect anyone. Medical researchers still do not know what causes it. Each year, about 6,000 people in the U.S. are diagnosed with this disease. In general, veterans, athletes, and middle-aged men are somewhat more likely to contract ALS. Well-known people affected by ALS include physicist Stephen Hawking, playwright and actor Sam Shepard, educator Morrie Schwartz (of Tuesdays with Morrie fame), bassist Charles Mingus, football player Steve Gleason, and baseball player Jim “Catfish” Hunter from Hertford, North Carolina. Locally, I have been surprised by the number of people with poignant personal stories of someone who has suffered from ALS. I welcome the opportunity to hear these stories. Since Lou Gehrig died of the disease in 1941, the development of effective treatments has progressed very little. In 2009, Dr. Stan Apple told a Congressional committee “ALS is not an incurable disease. It is an underfunded disease.” And the funding to support critical research results in part from a lack of awareness. I live two lives. As the Dean of Libraries, I am committed to, and excited about, supporting learning and research on this amazing campus. I enjoy having the opportunity to talk with students and faculty about their lives, studies and future. As a person with ALS, I am actively looking for ways to slow the progression while at the same time, doing all that I can to make a difference in the fight against this terrible disease. I am an advocate for ALS patients and for fundraising to support research that will eventually find a cure. I was recently selected to serve as an ALS Research Ambassador by the Northeast ALS Consortium, a program out of which the well-known ALS Ice Bucket Challenge emerged. Ten years after Dr. Apple’s testimony, ALS remains an underfunded disease, both in terms of research, and in terms of patient care. In 2014, the ice bucket challenge jump started funding for research. But we have a long way to go. Research is expensive. In addition, the cost of caring for someone with ALS is extraordinary. As the disease progresses, patients require electric scooters and wheelchairs, handicapped accessible vans, chairlifts in their homes, and endless adaptive equipment. Medical care includes physical therapy, occupational therapy, nutritional counseling, and frequently includes such surgeries as tracheostomy and gastrostomy. Most people require additional medical care in their homes. Some require around the clock care. Most people are challenged to make ends meet. Fundraising to support research and patient care will remain an important issue for the foreseeable future. Here in the High Country, we have several opportunities to make a difference. Each April, six regional ALS walks take place around the state with the help of the North Carolina Chapter of the ALS Association (they have a great website). I would love to see Appalachian State University, Boone, Watauga County and the High Country organize a seventh regional walk for ALS. The Joe Martin ALS Foundation, based in Charlotte, raises money to provide free home care services to ALS patients and their families. While the foundation has historically focused on Charlotte, they told me that they would be very interested in expanding their services to the High Country. We have discussed the possibility of holding a musical event here to raise money in support of the foundation’s efforts. On a daily basis I experience amazing generosity from Appalachian State students, faculty, and staff who help me physically navigate our hilly campus. I am so grateful to all of you who open doors and help me get back and forth to my car, and who go out of your way to make a difference in my life. My wife, Jenny, and I are so appreciative for all the meals made, as she takes on the many tasks that we used to share. We are blessed to know what it means to be a Mountaineer. Appalachian State University is really special place, and a very special community. Thank you for your continuing care and support. Letter to the editor: Why should students care what faculty get paid?